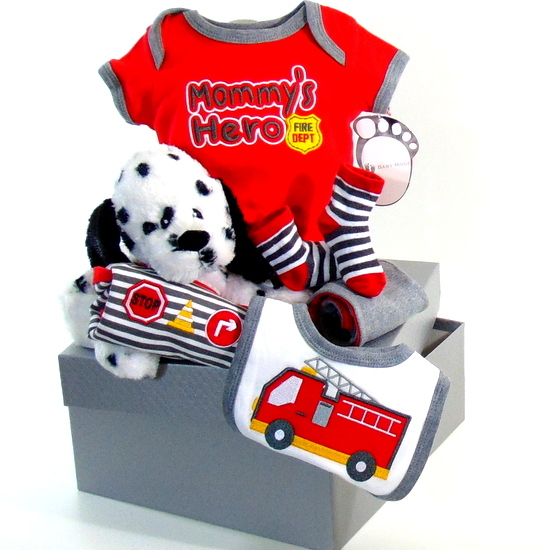 Firefighter Baby Gift Basket a beautiful gift box filled with firefighter theme newborn clothing and Dalmatians puppy to welcome and celebrate the newborn, Free Toronto Delivery! Baby gift package firefighter gift basket. The best Baby boy or girl gift basket. The silver square keepsake gift box great to store future baby items. Baby gift package. 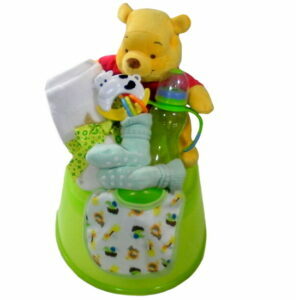 Send the silver gift to newborn with all firefighter items siting inside box. Red baby bodysuit embroidered Mommy’s Hero Fire Dept. Grey and red striped baby socks. Baby Dalmatians puppy stuffed animal. Grey striped baby bodysuit embroider Stop, Fire Hydrant and turn signs. Grey baby pant with red stripes. Red Fire Truck embroidered baby bib.